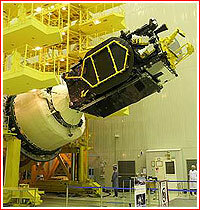 Russia's workhorse rocket failed to deliver the nation's communications satellite, furthering checkering its record. A Proton rocket with a Briz-M upper stage lifted off from Pad No. 39 at Site 200 in Baikonur on Dec. 8, 2012, at 17:13:42 Moscow Time. It carried the Yamal-402 satellite for Moscow-based Gazprom company. The spacecraft was to be place into a geostationary orbit at 55 degrees East longitude over the Equator. 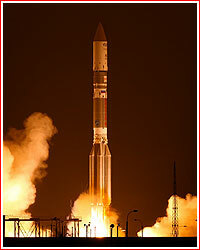 The separation of the payload from the upper stage was planned nine hours 15 minutes after liftoff (02:28 Moscow Time on Dec. 9), however at 10:27 p.m. EST, the International Launch Services, ILS, the company responsible for marketing Proton to commercial customers, announced an "anomaly during the launch." "Preliminary flight information indicated that the 4th and final burn of the Briz-M engine ended about four minutes early and subsequently separated the spacecraft," ILS said. In the meantime, available telemetry from the mission showed that previous three maneuvers of the Briz-M upper stage and the separation of its external propellant tank had been concluding increasingly earlier than scheduled. According to ILS, Thales Alenia Space was recalculating all the Launch Early Orbit Phase (LEOP) parameters in order to propose the possible recovery plans to Gazprom Space Systems. "A Russian State Commission will begin the process of determining the reasons for the anomaly... In parallel with the State Commission, ILS will form its own Failure Review Oversight Board (FROB). The FROB will review the commission’s final report and corrective action plan, in accord with U.S. and Russian government export control regulations. In the meantime, GKNPTs Khrunichev, the Proton rocket developer, announced on December 9 that the spacecraft was taken under control and a procedure to deliver it into the planned location for the following operational use was under review. Khrunichev later released another statement saying that during the morning of December 9, orbital parameters of the Yamal-402 had been assessed and all systems onboard the satellite had been functioning well. According to calculations, two additional firings of the satellite's engine were expected to insert the spacecraft into its planned orbit, Khrunichev said. According to the company, the first maneuver as planned for the night from December 9 to December 10. Following all the maneuvers, the spacecraft would be transferred to Gazprom on January 8, as it was originally scheduled, Khrunichev said. The statement did not specify how much of the satellite's propellant would be used for unplanned operations to salvage Yamal-402 and what effect it could have on the projected lifespan of the spacecraft. According to an unnamed source at Gazprom quoted by RIA Novosti news agency, the operational life of Yamal-402 could be reduced from 15 years to around 11 years. The nominal mission scenario reportedly featured four firings of the satellite's engine before it would reach planned orbit around a week after launch. The source was also quoted as saying that a onboard preprogrammed sequence commanded the satellite to partially unfurl its solar panels (following the separation from the upper stage). However a complete deployment of solar panels was scheduled after the completion of orbital maneuvers. The Yamal-402 spacecraft was built by Thales Alenia Space with ISS Reshetnev (NPO PM) as a component supplier. The original agreement for the development of the satellite was reached in February 2009 and the launch was expected on the European Ariane-5 rocket. However on January 21, 2010, a shareholders' meeting of Gazprom Space Systems approved an increased involvement of the Russian industry into the project and switched the launch provider to GKNPTs Khrunichev's owned ILS, which markets Proton rockets. According to industry sources, then head of GKNPTs Khrunichev Vladimir Nesterov wrote a letter to Vladimir Putin, complaining about plans by head of Gazkom communications company Nikolai Sevastyanov to launch Yamal-402 on Ariane-5. State-controlled Gazkom then received a huge reprimand from the Kremlin and had to move the satellite on a Khrunichev-built Proton. 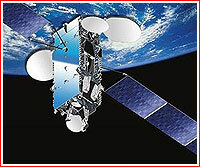 On May 28, 2010, it was announced that the larger of the Yamal-400 series -- the 5,250-kilogram Yamal-402 would still be built by Thales Alenia Space and launched into a geostationary transfer orbit to provide fixed communications and transmission services over Russia, CIS, Europe, the Middle East and Africa (at the orbital location of 55 degrees East longitude). Both satellites were to have an anticipated service life of 15 years and expected to be launched in 2012. Thales Alenia Space based the design of the Yamal-402 satellite on Spacebus 4000 C3 platform. The spacecraft carried 46 Ku-band transponders covering Russia, Europe and South Africa. Interestingly, the official Russian media reports about the Yamal-402 launch were mostly omitting the fact that a foreign company had built the satellite. At one point, the launch was planned at the end of October 2012, however during the fall it was rescheduled to December 8. The spacecraft arrived to Baikonur on November 6. On Dec. 12, 2012, the semi-official Interfax news agency quoted Gazprom representatives as saying that controllers of Thales Alenia Space in Cannes, France, had succeeded in conducting the third out of four planned maneuvers to insert Yamal-402 into its planned orbit. According to the Russian media, the first engine firing onboard the satellite was conducted during the night from December 9 to December 10 and the slightly shorter second maneuver took place during the night from December 10 to December 11, 2012. According to RIA Novosti news agency, an hour-long third firing was conducted during the day on December 12 and the final orbit correction was planned for the night from December 14 to December 15, 2012. By the end of the day, on December 14, 2012, Yamal-402 did reach its planned orbit. The investigation into the third failure of the Briz-M upper stage in the past two years was led by Deputy Head of Roskosmos Aleksandr Lopatin. According to ILS, the Russian working group, convened by Roskosmos, included independent experts from TsNIIMash, the leading institution of Roskosmos to support design, development and research into rocket and space articles, and Keldysh Research Center, the leading Russian entity for rocket engines. The commission which worked at GKNPTs Khrunichev, the manufacturer of Briz-M, considered various failures scenarios, but made no public announcements about possible causes five days after the botched launch. However, by December 13, industry sources said that a turbopump (feeding propellant into the main engine of the Biz-M upper stage) was considered a likely culprit. On January 11, 2013, the International Launch Services, ILS, announced that Roskosmos management had reviewed and approved the report provided by the Russian working group investigating the anomaly during the Yamal 402 mission and have provided the report to GKNPTs Khrunichev. ILS promised to release the findings on the identified most probable root cause of the anomaly and the required corrective actions after the document clears Russian security during the week of January 21st. According to ILS, it has formed a Failure Review Oversight Board, FROB, which was to review the Commission’s final report and corrective action plan, in accordance with U.S. and Russian government export control regulations. The FROB was to begin in Moscow on January 30th and consisted of ILS customers, industry subject experts, and insurance industry representatives. The FROB was to provide an independent review of the investigation, root cause and corrective actions required prior to return to commercial flight. After the conclusion of the FROB, the FROB report will be briefed to ILS customers and the launch insurance industry, ILS said. ILS also confirmed that Yamal-402 had been declared fully operational on January 8, 2013, after completing its on orbit tests. However, the rescue operation paid with a four-year worth of propellant onboard the satellite. In the meantime, industry sources posting on the web forum of the Novosti Kosmonavtiki magazine, reported that a prolonged expose to the sunlight between the third and fourth firing of the Briz-M's engine affected viscosity of the propellant and caused cavitation during the fourth firing. As a result, a ball-bearing assembly in the engine broke and a the propellant line was cut off, leading to a premature shutdown of the engine. To correct the problem, engineers planned to increase the amount of pressurization in the propellant system of the rocket stage and to schedule coasting periods between engine firings to give more time for the cooling off of the propellant. On February 12, the International Launch Services, ILS, announced that its Failure Review Oversight Board, FROB, concluded its review on February 7, concurring on the most probable root cause and the associated corrective action plan of the December 8, 2012, anomaly of the Yamal 402 Proton launch. According to the ILS, the members of the FROB agreed with the findings of the Russian investigation that the most probable root cause of the failure had been due to a combination of adverse conditions which affected the operation of the Briz M main engine during the startup of the 3rd burn causing damage to a bearing on the oxidizer side of the turbo pump. This ultimately resulted in the failure of the bearing during the 4th burn and caused the 4th burn of the Briz M to end about four minutes early, with subsequent separation of the spacecraft, ILS said.